Throughout history, woman has always “officially” been assumed to be inferior to man. That I, it’s been the thinking on most of the dominant cultures in history, and certainly in the big cultures that have survived into the present day. Even today, many believe that women are weak, often intellectually inferior, and generally less capable than men. Ladies, we know it’s not true, but historically we weren’t the ones writing the books either. Even in times of the most adamant male dominance, rare women of extraordinary quality found the right strategies to truly shine. 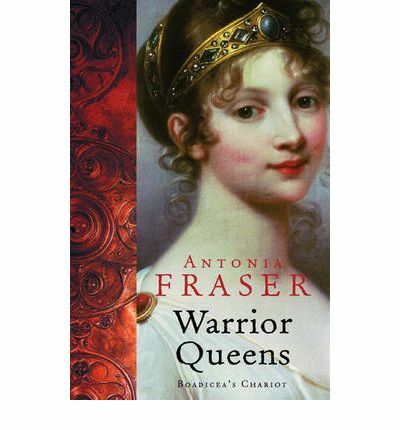 In Warrior Queens, author Antonia Fraser focuses on the female rulers who’ve set themselves apart. She focuses not only on their accomplishments, but on the tools they used to rise to the top and stay there despite the male chauvinism around them. This book caught my eye immediately because of its portrayal of the Boudica or Boadicea (spelling depends on source), the queen of the Iceni who decided to take on Rome during the height of its power. I’d done some research on her already, and her story never fails to enthrall me. Antonia Fraser delved deeper into her strategies and successes, as well as the legends around her, and provided a whole host of amazing women through history whom she compares to that determined queen. Fraser discusses several types of “warrior queen,” classifying them by the tools they used to obtain dominance. These include the Holy (Armed) Figurehead – that is, the goddess or saint image – and the Appendage, who was raised to her position by the men around her, among others. Fraser draws comparisons between each ruler and her predecessors throughout the book, and includes the likes of Cartimandua, Cleopatra, Queen Isabella of Spain, Queen Louise of Prussia, Queen Elizabeth I of England, the Indian Rani of Jhansi, Golda Meir, Margaret Thatcher, Indira Ghandi, and many more. Antonia Fraser is a well-known biographer who has written a large number of other books, of which I have only previously read The Wives of Henry VIII. Compared to that book, Warrior Queens is somewhat dry and gets a little bogged down in places. That said, it was also written considerably earlier than that Tudor history. Looked at with all other books in its class, it is a very enlightening text that, other than the aforementioned dense spots, moves along quite nicely and offers a unique view on many of these historical women. There is an element of feminism in this book, which is something I’m beginning to expect from Antonia Fraser. She does make a point to put down some of the most radical feminist notions on these various subjects and keeps the preference to a minimum, and it’s hardly surprising that there’s a moderate amount in a book of this nature. In fact, I attribute her feminism mostly to her admiration for the people she writes about rather than a deep-set belief in the superiority of women over men. Both of the books I have read by Antonia Fraser have left me with a whole store of additional knowledge that I had not been able to glean from some of the traditional “school book” history texts. Warrior Queens follows along the lines of popular biographies about such women as Abigail Adams, but in a way that spans different time periods, places and cultures while linking them all together. I definitely recommend Warrior Queens to obtain a better perspective on female rulers in history, or even for your own edification regarding feminine power. Let’s face it, it’s easy to feel somewhat weak and intimidated by the world around us sometimes – especially when there are people who go out of their way to foster that impression. If that’s you, then this book is a great reality check. I first read this book nearly a decade ago, and the stories and strategies still grab my interest and inspire me in my daily business dealings. Overall, it’s definitely a great book with very little to detract from it.